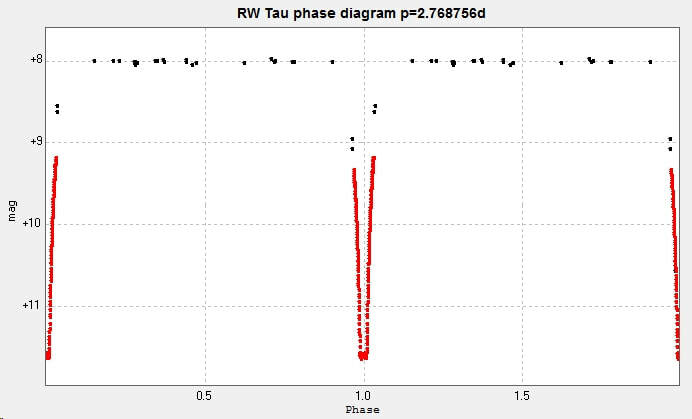 RW Tauri is an EA type eclipsing binary with an interesting o-c curve (Kreiner et al). It has been suggested that the system involves mass transfer between the components (Plavek, Dobias 1983). The fact that the period of this star is not constant, but sometimes increases and sometimes decreases, results in calculated minima becoming more and more in error with observations. Depending on which data is used (GCVS, AAVSO VSX, BAAVSS, AAVSO) the calculated minima can differ by almost two hours. It was one of my program stars with The Bradford Robotic Telescope. Before the demise of this observatory, I acquired 28 images with the Cluster Camera ('green' filter) between 2014 October 14 and 2016 October 1. 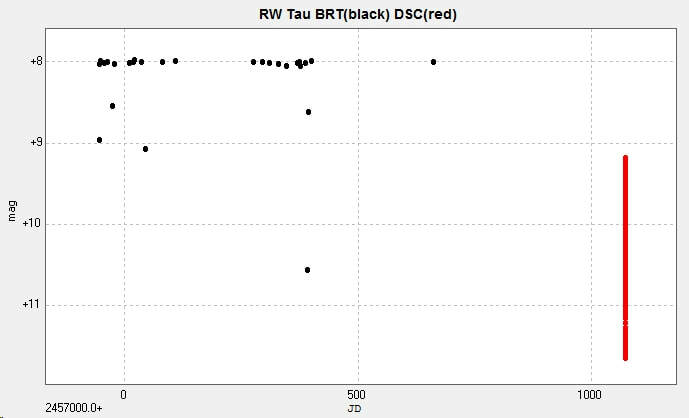 The photometry of RW Tau from these images is plotted in the following light curve. 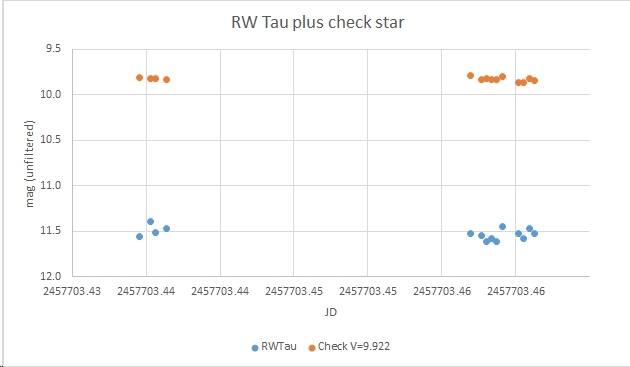 RW Tau has a catalogued period of 2.768783 d with an epoch in 2002 (Kreiner), or 2.7688356 d with an epoch in 1983 (AAVSO VSX , GCVS). 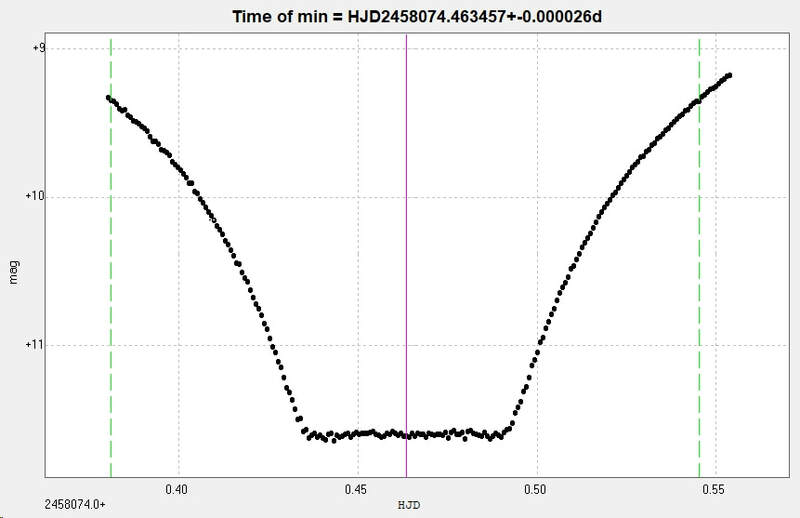 Using my derived time of a minimum (from 5 data points!) 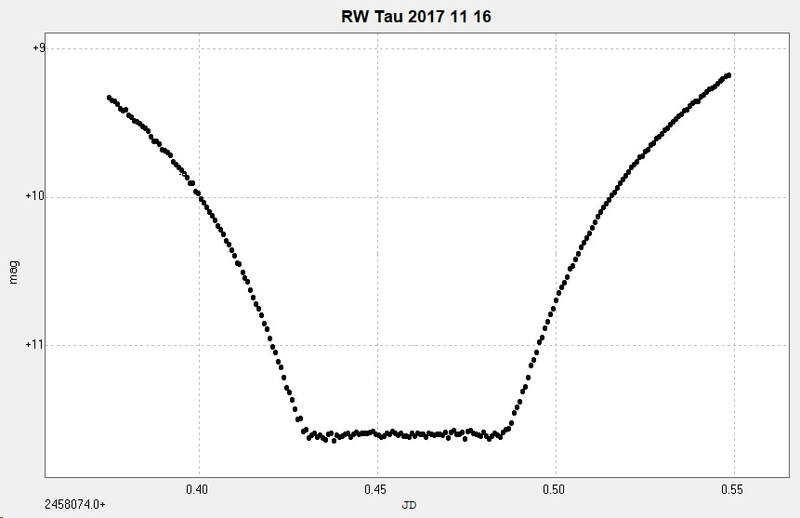 of ~HJD 2457390.57782 and Kreiner's value for the period I managed to take a number of images of RW Tau through breaks in the cloud from Somerby Observatory on 2016 November 10 with the 2" Titan. These observations were all during the total phase of the eclipse. This star is currently (November 2016) the subject of a BAA VSS project. A primary minimum observed from Somerby Observatory on 16 November 2017 with the 2" Titan. 225 unfiltered images were reduced to produce the following light curve. The HJD time of minimum was calculated in Peranso.. The time of minimum was HJD 2458074.463457 +- 0.000026d. 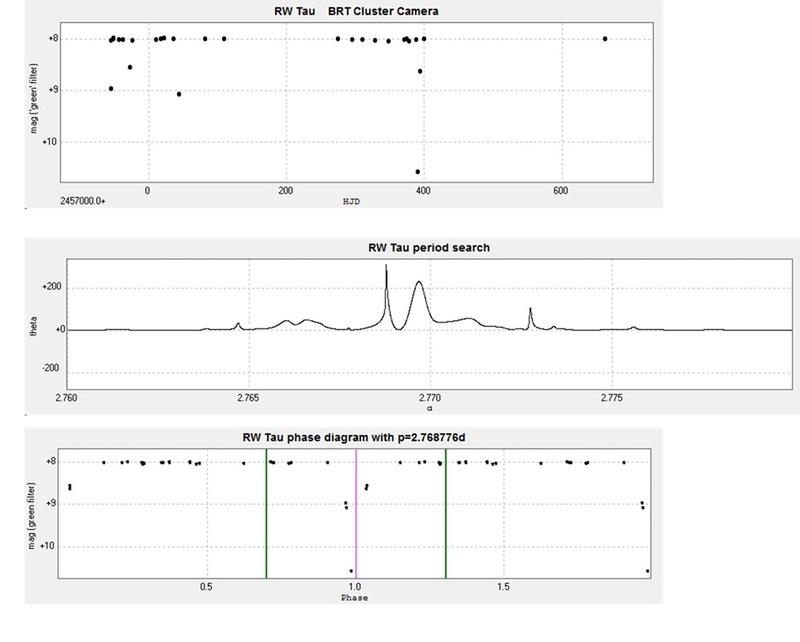 Combining these results with the BRT observations produces the following light curve and phase diagram. BRT observations in black, 2" Titan observations in red.